83: Frankenstein with The Indoorswomen! This week Kyle and Claire get to discuss a foundational work of science fiction. Frankenstein by Mary Shelley. Joining them are Jen and Meg from the podcast, The Indoorswomen! Courtesy of our guests, we kick the episode off with a delightful segment called “What Are We Drinking?” and follow it up with a game of “TV Trope Roulette”. Next, it’s time for a bit of history and production. 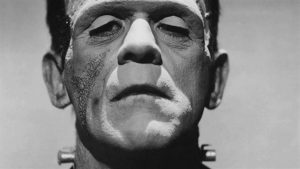 Claire explains why Frankenstein is considered the original work of science fiction and how the genre’s existence is rooted in major movements of ideas and technology. Kyle details the life of Mary Shelley and the unusual circumstances and company that led to her story’s creation. Afterwards we enjoy a group discussion of monster tropes derived from Frankenstein, notable adaptations of the classic work, and our thoughts on the original. You can check out episodes of Jen and Meg’s podcast here. And you can learn more about Meg and her book, Red Tea, here.